Translated: "Blessed Gemma Galgani in ecstasy receives the Stigmata"
This year (2013) marks the 110th year since Saint Gemma's holy death on April 11, 1903. Countless souls over the years have been greatly inspired and edified by Gemma's fervent love for Jesus and Mary. Her heart was all on fire with the love of Jesus and the love of souls, and she expressed her love for Him so well in her writings. Jesus was everything to Gemma and she loved Him with all of her being and because of this many souls throughout the world have found Gemma to be a most lovable Saint whom they admire and in whose tender love they seek to imitate. For those who begin reading her life and writings (diary, autobiography, letters, ecstasies etc) soon become enraptured by her and are greatly inspired by this "Gem of Jesus", and often such souls soon begin calling upon her in prayer, and by doing so many have found her to be a very powerful and devoted friend and heavenly advocate. May St Gemma continue to inspire souls and lead them ever closer to her Jesus. May her life of sacrifice and love continue to bear fruit for us and may she continue to obtain heavenly graces for those who call upon her in prayer, especially those most in need in Jesus mercy. St Gemma, pray for us! "Oh Jesus, what would have become of me, if you had not drawn me to You?.....I am Yours, Oh Jesus!..Jesus I love Thee! Open Your heart to me; I wish to place all of my affections there. I open mine to You! Pardon me, oh my Jesus for so much carelessness and so much indifference. I am blessed to have you as my patron saint. Thank you for your intercessions for my intentions. I always feel relieved and consoled by praying to you, knowing that you are beside our heavenly Father. Happy feast day to us! Happy Birthday into Heaven, my Dear Saint Gemma! Is to make me a saint like you. In Jesus name. Happy Feast Day to our beloved St. Gemma Galgani! It was St. Gemma that brought me back to Our Lord, Jesus Christ! Thank you St. Gemma for answering all my prayers! May I continue to love you and ask for your prayers to offer to Our Lord each and everyday of my life! 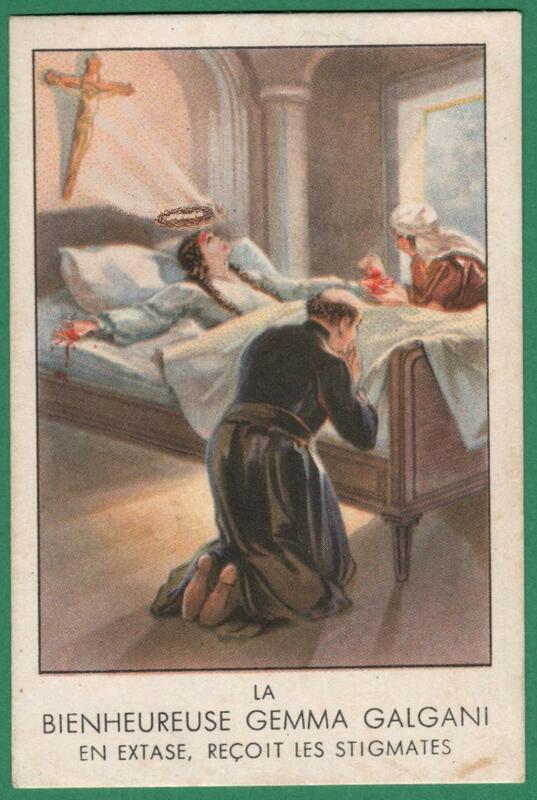 All of Heaven are rejoicing for you St. Gemma Galgani!! !